Rosemary essential oil is one of the most popular aromatherapy oils. It has been used over the centuries for its various therapeutic benefits. Rosemary oil extracts are distilled from the leaves of the rosemary bush, an herb from the mint family and commonly found on the spice rack. It also has the ability to darken gray and the aromatherapy effect improves memory. Rosemary essential oil is one of those powerhouse oils that serves us in many ways. Rosemary essential oils are known to promote hair growth and strengthen hair by stimulating the hair follicles. With regular use of rosemary oil hair fall decreases. Head massages using rosemary oil help stimulate blood flow to the scalp. This nourishes the scalp, reversing dryness and dandruff. 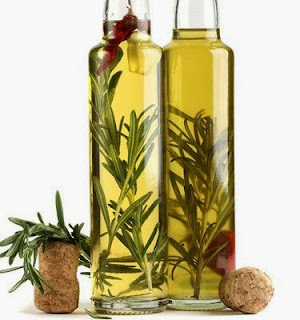 Apply rosemary hair oil to your hair and scalp regularly to keep your hair lustrous and healthy. Rosemary oil may help stimulate mental activity and improve concentration. Inhaling the aroma of rosemary oil may prevent memory lapses will improving your mood and energy levels. Rosemary oil has powerful disinfectant and antiseptic properties which help to treat acne and oily skin conditions. Massaging your face with this oil improves skin complexion by lightening dark spots and blemishes on the skin. Rosemary oil may act as a pain reliever when applied directly to the source of the discomfort. For example, rosemary oil is often used to relieve headache pain, sore muscles and arthritis. The astringent and anti-bacterial properties of Rosemary oil makes it effective for the treatment of dental conditions like bad breath, plaque build-up, cavities and gingivitis. Being a disinfectant, it is often used as a mouthwash for keeping your gums and teeth healthy.